Colorful Batik Panel Quilts shows how to make bold, graphic and joyous art quilt projects and home décor using batik panels created by Indonesian artisans. 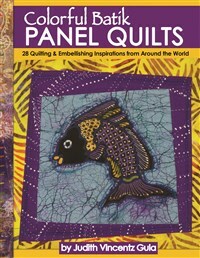 Readers can explore the many creative possibilities of working with fabric panels with this inspirational book as their guide. Fabric artist Judy Gula is the owner of Artistic Artifacts in Alexandria, Virginia, which sells products for sewing plus a full range of supplies and materials for fiber art and embellishment. Judy loves to share her wealth of knowledge and textile travel experience with quilt guilds and art groups. She finds inspiration in new and vintage materials, her interactions with other artists, and in surprising and unexpected experiences. Her lectures and workshops highlight how today’s artists are using materials from many different disciplines to create mixed media collage work and fiber art.